This delightful disc is a collaboration of five artists of five different but related art forms: poet, composer, musician, storyteller and singer. The poet, Juan Ramón Jiménez (1881-1958), was highly regarded in his native Spain (he received the Nobel Prize for Literature in 1956). 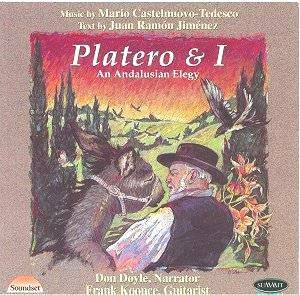 His output of over twenty five volumes, contained a work of prose 'Platero y Yo', within which we hear the speaker relate to Platero, his faithful ever attentive donkey, his inner-most thoughts and feelings whilst they go about their everyday business in the Spanish village of Moguer. The strong bond between master and donkey soon becomes apparent. In 1960 the Italian composer Mario Castelnuovo-Tedesco (1895 - 1968) set twenty-eight verses of 'Platero y Yo' to music for guitar. During the 1960's and 70's Andres Segovia included some of them in concert programmes, also recording a number, but without narrator. Now, thanks to guitarist Frank Koonce and storyteller Don Doyle, we have the first recording in English of seventeen verses of 'Platero y Yo - Platero and I'. Frank Koonce has produced on this disc some of the most beautiful playing and refined sound I have heard recently, always supporting the narration of Don Doyle and both of them exploiting the delicate nuances of interplay between score and text. This is further augmented by the occasional contribution of the soprano, Sherrie Grieve, singing in Spanish some of the more poignant moments beneath the spoken words. The collaboration has resulted in a most satisfying, charming experience. Whilst recognising that this may not be to everyone's taste I'm sure it represents a milestone in the repertoire of guitar and literature together.